How can a madman fall in love? "I will marry you," Perdita Halley said to Alexander von Reisden at eighteen, "but not until I study music." Now, at twenty-one, she has come to Paris, his city--but music still stands between them. She is pursuing her dream of becoming a concert pianist; he is trying for the less likely one of becoming an ordinary, unhaunted man. They are drawn into an all-consuming passion that seems destined for tragedy. Perdita cannot marry and attend the Conservatoire; Alexander, still haunted by his past, fears to marry at all. "Stunning," said The New York Times Book Review of Sarah Smith's historical mystery, The Vanished Child. Now, with The Knowledge of Water, Sarah Smith delves even more deeply into the realm of deception and menace that she has made uniquely her own. 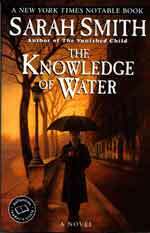 Set in Paris during the devastating flood of 1910, The Knowledge of Water is a lush, complex, beautifully written novel about the consuming pleasures of passion and the obsessive perils of art. It has extra goodies, like an interview and stuff for book clubs. Hey, collect both versions!